Q: What inspired you to first get involved with activism? A: Animals are being violently abused every minute, of every day. We have an obligation to every animal suffering behind the closed doors of labs, farms and zoos; to every victim of speciesism to speak out for them. 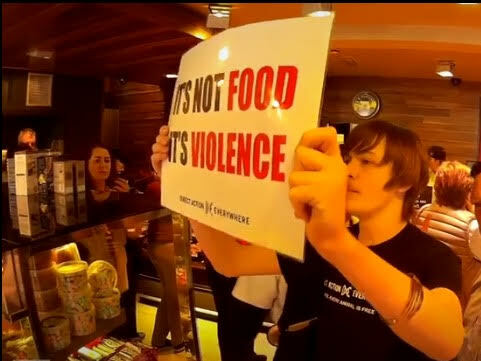 As ACT UP put it, "silence is death," and that is true for the animal rights movement also. We must be animal rights activists! A. My favourite DxE moment in our local chapter was at our March day of action 2017 when we disrupted 5 out of 6 butchers in a town in Northern Ireland and we reached over half a million people with our post about the action and we made national newspapers. We had managed to get people talking about animal rights who otherwise would never have even considered it. We had done what no other group in Northern Ireland had ever done before. In my local DxE chapter I am an organiser and I am involved with the DxE connections, protest and meetups working groups. As our chapter grows we plan to have more working groups. DxE is such a supportive and empowering network of truly inspiring, amazing activists. Having our incredibly supportive community as well as knowing that we WILL achieve animal liberation within one generation keeps me motivated. Seeing how our Bay Area chapter is changing Berkeley is really inspiring, and I hope some day to move to Berkeley to join the ever-growing DxE community there. We are on the right side of history and we should be confident in our actions. We have the science and history of social change on our side. DxE's 40 year plan is becoming reality and we must continue to disrupt violence and speciesism so that in 40 years we will see a changed society and a species equality act passed. When I see my nonhuman friend, Tink, I see a person, an individual who has as much of a right to life as you or I and someone who deserves autonomy over her own body. To me Tink is the person she is, not "property" or any other degrading words society uses for animals, but for most animals their children are ripped from them at birth, their milk or eggs stolen, their very existence being seen as worthless unless they can make enough milk to be stolen or are the 'right' gender to torture and abuse for their eggs. They're seen as property and commodified so much that the compassionate act of openly rescuing sick animals from places of violence is seen as a crime. This is unquestionably discrimination. This is speciesism and we must fight until every animal is free.